The telephone greeting often is linked to the Khmer phrase for “how are you?” The populace apparently has tired of the words, and many can be counted on to reassemble the few syllables in their response to amuse themselves. Men are gold, women are cloth. . . The implied meaning is that men who do something unacceptable are like gold; they will be as clean as the metal after it is washed. The converse is suggested for women; when sullied, even washing won’t rinse off all the dirt. They will be perpetually dirty objects of scorn. 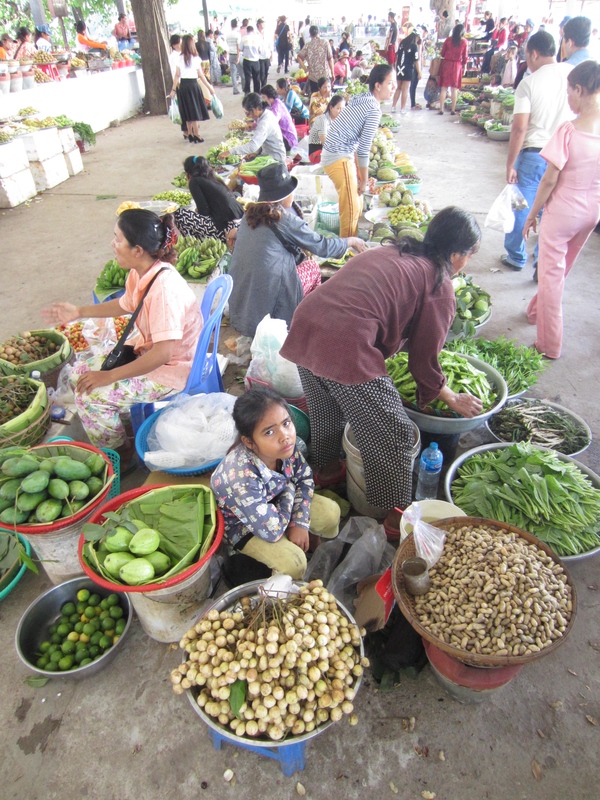 This is not my local market, but, other than its spaciousness, it’s typical of indoor markets found everywhere in Cambodia. I recall that I took this photo on an important Buddhist holiday. Closing in on two years in this country, I relish more than ever my daily encounters with Cambodians and the chance to practice my atrocious grasp of the language. It is quite another thing to climb the Mount Everest of fathoming a normal rush of words that I know yet fail miserably to hear when they are strung together in speech. I long ago gave up trying to read or, horrors, write the language. But words and some grammar are beginning to sink in and I now can engage in the most rudimentary of short conversations such as ordering food in a restaurant. The big problem with learning Khmer where I usually range is that almost everyone seems to speak enough English that I am not called upon to use the local language. Moreover, they usually don’t expect me to speak Khmer and I don’t always expect them to speak English, inevitably causing confusion. Still, I persist stubbornly. 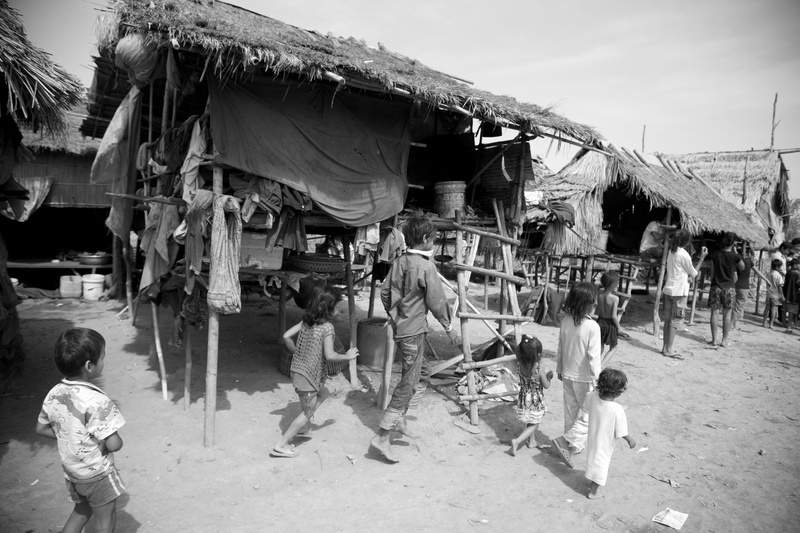 Far too many Cambodians live like this in the provinces, even within Phnom Penh limits, with few having either the means for or access to (or both) maternity healthcare that normally is appropriate. This post is published verbatim with the permission of Banyan Blog, where it originally appeared. The writer’s insights are always worth reading, and I highly recommend the blog as well as its Twitter feed. The source of all but one of the photos, which I have added to the Banyan Blog post, is Kuma Cambodia, funded by a Norwegian association that goes by NAPIC. 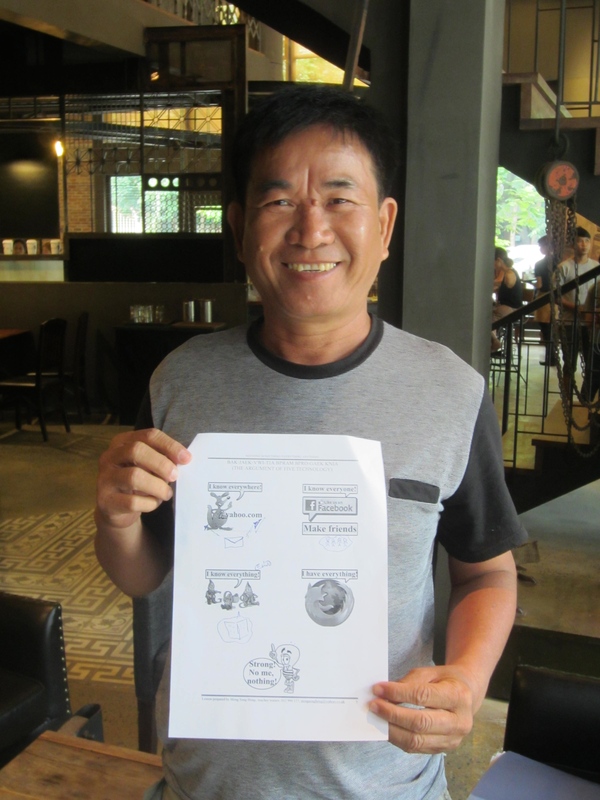 My teacher with one of his lessons at Brown coffee house, where I often do my language homework. On this day, however, Meng tutored me there prior to my upcoming travels. It was seven or eight months ago that I started studying the Khmer language. I wrote in this space that I felt it was wrong to live in Cambodia or any other foreign country without trying to learn the language. My opinion has not changed, but circumstances have forced to me think hard about my goals. One such circumstance is a few weeks of travel starting Aug. 13. Why study a language that only 15 million speak? The language of Cambodia, called “Khmer” and usually pronounced K-mye, is hardly heard around the world. No one who doesn’t live here needs to speak, understand or write it. It happens that I have an aptitude for language. I can get along somewhat in French and Spanish (the latter sadly falling into disuse now that I have left New York) perhaps because I took the not unusual path in olden times of studying Latin for a year or two in junior high school. Thus did I decide to pick up a little Khmer when I decided last year to move to Phnom Penh. With echoes of the Ugly American reverberating in my brain, I considered it appropriate to study the language if I was to be a resident of the country. Not to learn the language struck me then and strikes me now as arrogant.